1. Single Server & Single Client. Both are on same machine. 2. Single Server & Single Client. Both are on different machines. 3. Single Server & Multiple Clients. 4. Multiple Servers & Multiple Clients. Today, I am going to discuss the very first & basic scenario where only one Server & one Client is present. Client will request Date and Time on Server; where in the response of the same Server will give answer as current Date and Time on Server. So, lets go into implementation details of the same program in Java. JAVA provides "java.net" package which contains classes required for network programming. Communication over a network takes place via a protocol like Internet Protocol (IP), Transmission Control Protocol (TCP), User Datagram Protocol (UDP). Any Protocol is set of rules & standards required to complete communication. A protocol specifies the format of data being sent over a network, along with how and when it is sent. At the other end of communication, the protocol also defines how the data is received along with its structure and what it means. On the internet, we have additional protocols like Hyper Text Transfer Protocol (HTTP), File Transfer Protocol (FTP). TCP/IP networking is appropriate for most networking needs. It provides a serialized, predictable and reliable stream of packet data. However TCP includes many complex algorithms for dealing with congestion control on crowded networks as well as pessimistic expectations about packet loss. Datagrams are alternative to TCP/IP protocols. They support fast and connection-less transport of packets. However they are unreliable as there is no assurance that the packet is not damaged in transit or that whoever sent it is still there to receive a response. However UDP relies on few network resources. A key component of the internet is the address. An internet address or IP Address is a 32 bit (IPv4. 128 bit in IPv6) number that uniquely identifies each computer physically attached to the internet. This name can be associated with a Domain Name. An internet domain name is mapped to an IP address by the Domain Naming Service (DNS). At core of JAVA's networking support is the concept of a Socket. A socket is a software endpoint that establishes bidirectional communication between a Server program and one or more Client program. 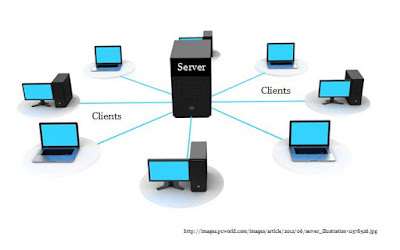 The Socket associates the server program with a specific port on the machine and from where it runs any client program anywhere in the network. Sockets are at the foundation of modern networking because a socket allows a single computer (Server) to serve many different Clients at once as well as many different types of information. This is accomplished through the use of a port which is numbered socket on a particular machine. A Server is allowed to accept multiple Clients connected to the same port number, though each session is unique. To manage multiple Clients connections a Server must use Multithreading. Once a connection has been established, TCP/IP reserves specific ports for specific purposes for example 21 for FTP, 23 for Telnet, 25 for email, 80 for HTTP, etc. The protocol determines how the client should interact with the port. The lower 1024 ports are reserved for specific protocols , So we need to use ports from 1025 and later for our customized functions or communications. A Port is a 16 bit number that identifies each service offered by a network server. After getting all the basics of Networking & required methods in JAVA, this is time to go for the execution of one program. Following is the program in which One Server & one Client is present. Client gets connected to Server asks the current Date & Time of Server. In Reply Server sends its current Date & Time to Client. Note: First execute Server program & after that execute Client program. //Step 2. Now create a Client Socket on Server for Bidirectonal Communication. This Post is really nice and informative..